Patients assigned to receive virtual reality used a tablet and VR goggles to play an immersive game. Virtual reality (VR) was shown to reduce pain and anxiety compared with standard of care (SOC) during routine blood draws in children and adolescents, in a recent study published in the Journal of Pediatric Psychology. In this randomized controlled trial, 143 triads, consisting of a patient (age 10 to 21; mean age, 15.43), caregiver, and phlebotomist, were randomly assigned to receive virtual reality intervention or standard of care (topical anesthetic and a movie playing in-room) during a routine blood draw. Patients assigned to virtual reality used a tablet and VR goggles to play an immersive game. Pain, anxiety, and satisfaction were reported by patients and caregivers, and the patient’s experience was rated by the phlebotomist. Procedural pain, assessed using a Visual Analog Scale (VAS) and the Face Pain Scale-Revised (FPS-R) was significantly reduced in the VR group compared with SOC, as reported by patients (VAS: 1.31±1.59 vs 1.93±2.22; FPS-R: 1.40±0.73 vs 1.70±1.13), and by caregivers (VAS: 1.06±1.72 vs 2.26±2.68; FPS-R: 1.54±0.88 vs 2.02±1.30). 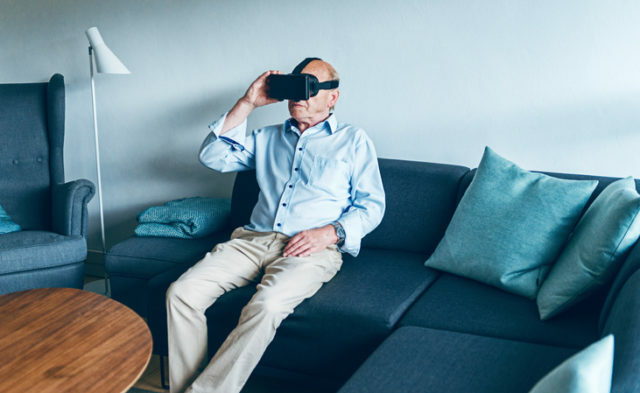 Procedure-associated anxiety, evaluated with and Anxiety VAS, was also diminished by the VR intervention vs SOC, as reported by patients (1.90±2.22 vs 2.48±2.07 and caregivers (1.52±2.03 vs 2.48±2.63). For patients with high — but not low — levels of anxiety sensitivity at baseline, VR intervention, compared to SOC, led to significant improvements in levels of anxiety (P <.001).